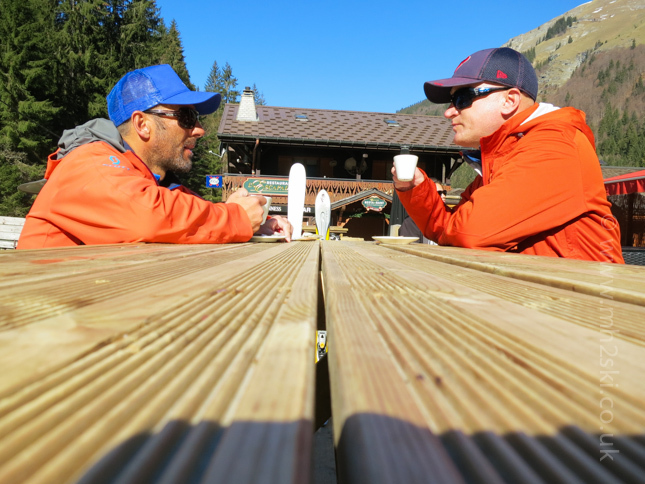 Just over a week ago I went across to Morzine to catch up with chum and fellow Ski Instructor, Tim 'Slippers' Jackson. If you are a regular reader of this blog, you will have come across Slippers before. I'm not actually sure if I've ever discussed how we know each. To my knowledge, I believe I first met him the summer of 1999 when we were both Mountain Bike guides in the Portes du Soleil. But it wasn't until the following winter when we really got to know to each other. 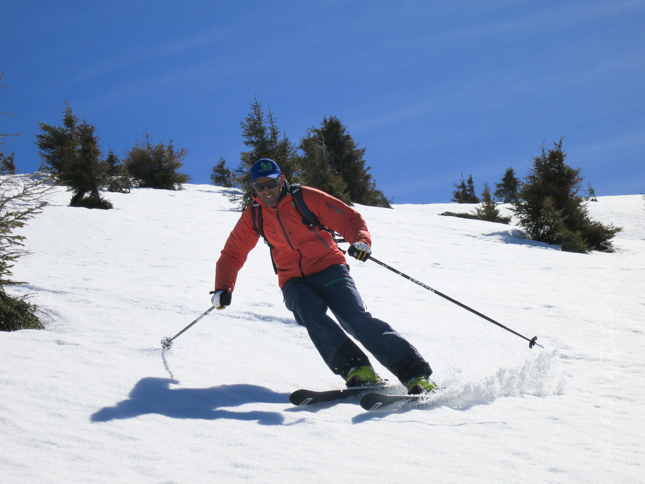 It was all down to training for the highest Ski Instructor qualification. Without going into too many details, it is tremendously hard to acquire what is now known as the BASI Level 4, which leads to the application for the Full French Equivalence. We have spent weeks - no months - in actual fact it might even add up to years, sharing apartments and training together. And we certainly have spent thousands of pounds to achieve this highest qualification. We both got there, eventually. So I guess you could say we have loads of history together. We even get to teach together sometimes as well, and managed to do this again this winter. 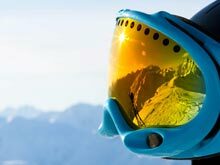 Most of the time during the ski season, we are all so busy it can be tricky to catch up. 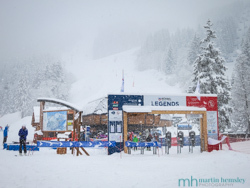 So it was great to have time at the end of the season to drive over to Morzine. He took me to a micro-brewery in Morzine. 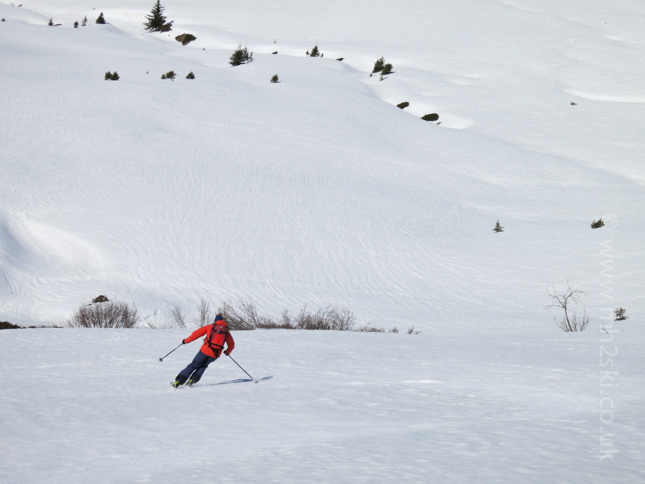 And we also went for a short ski tour to blow out the cobwebs, and kick start our summer fitness. 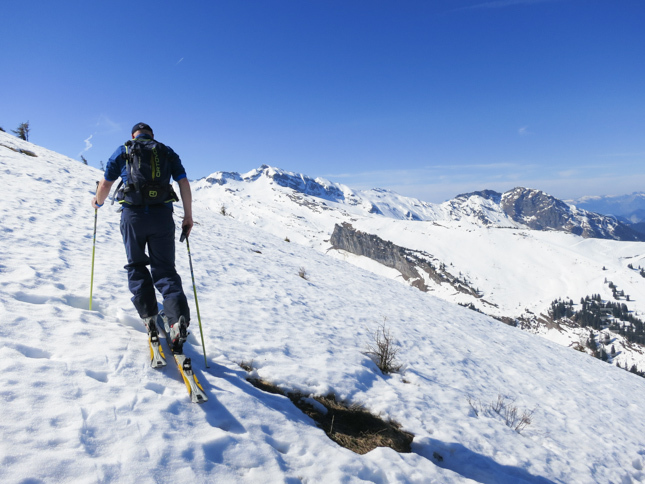 Ski touring is where you have the ability to leave the pisted ski area, and go for a tour out into the backcountry. 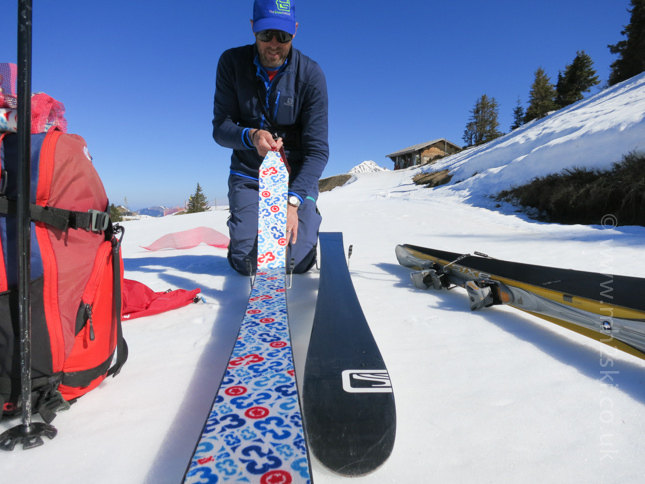 Uphill travel is acheived by attaching 'skins' to the base of your skis. In the above photo you can see Slippers attaching his. The description 'skins' comes from when many years ago seals' skins were used. Thankfully, these days the 'skins' are of manmade material. The skins allow you to slide/walk uphill by gripping into the snow, using adapted touring bindings that release from the heel. Many people would think why bother doing this, an understandable point. However touring allows you to visit areas of the mountain that otherwise wouldn't be possible. Plus, it's another way of getting some physical exercise, and this is turning into an ever more popular sport. This photo below shows me in the process of skinning up the slope, note how my heel has risen which allows me to slide uphill. Our goal was to go for a walk of between an hour to an hour and a half, and find some spring snow. More on that later. Just like with any sport that requires aerobic effort, it is important to pace your efforts. Especially when you are at higher altitude which has even more of an effect on your breathing. 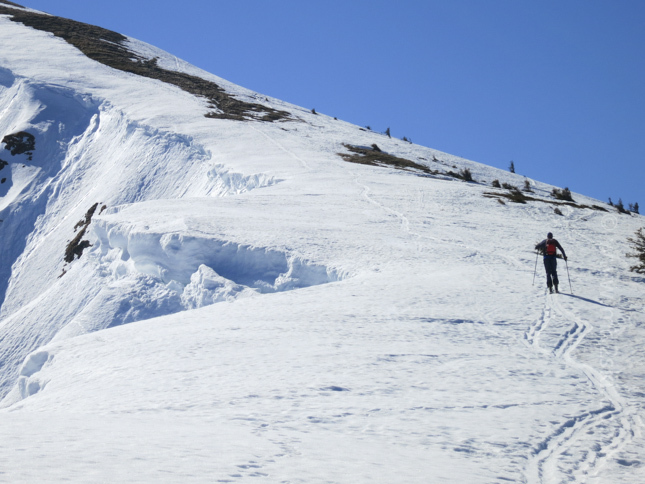 Sometimes skinning works, other times we had to compromise and adapt due to the conditions. 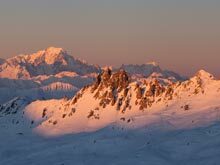 It was great fun being in the high mountains again, especially when we eventually reached the summit, called Pointe de Chesery for those who know the area. 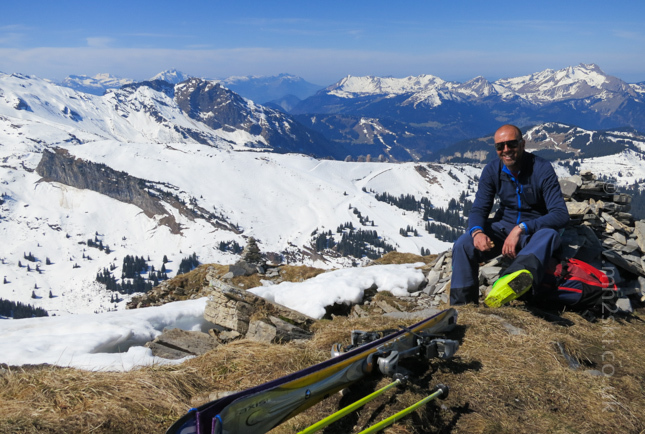 There were awesome views up there, looking across and around the Portes du Soleil domain. It was a good opportunity to have a quick snack and a slurp of water before heading off back downhill. Once the skins were taken off the base of the skis, and our heels of the bindings were re-attached, it was time to see what the snow was going to feel like. Spring snow is a description commonly used when the temperatures are warm during the day. This allows the snow to soften and gradualy melt. If it is cold enough at night, the surface of the snow will re-freeze. If you can time the descent right, the perfect time will be just as the snow is starting to melt late morning, but before it goes too soggy. So how was the snow this time? Some of the turns we had were gorgeous. The top part of our descent was the best, also due to the aspect. Pitches facing away from the direct sun held better. Another description used is whether the snow is 'supportive'. This means that the snow is supporting the weight of the skier. 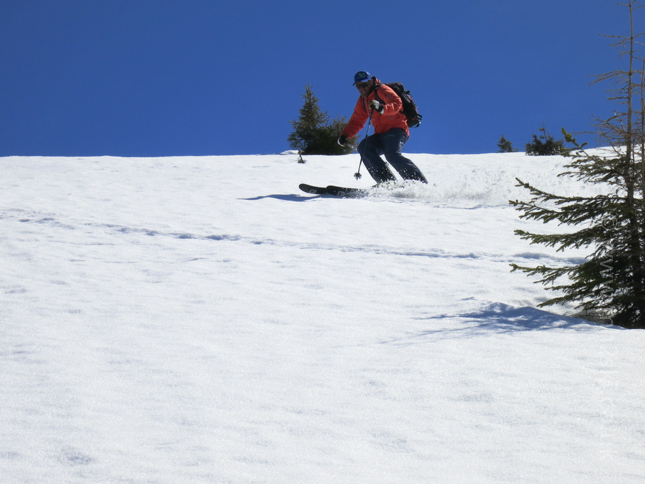 If the snow melts too much, the snow won't support the weight of the skier, making it very difficult to deal with. Towards the end of our descent, the snow was not 'supportive'. There are different techniques to try and deal with this challenge, other than crossing all fingers and toes. Whichever technique you adopt, subtlety is the key. Some options are prettier than others. 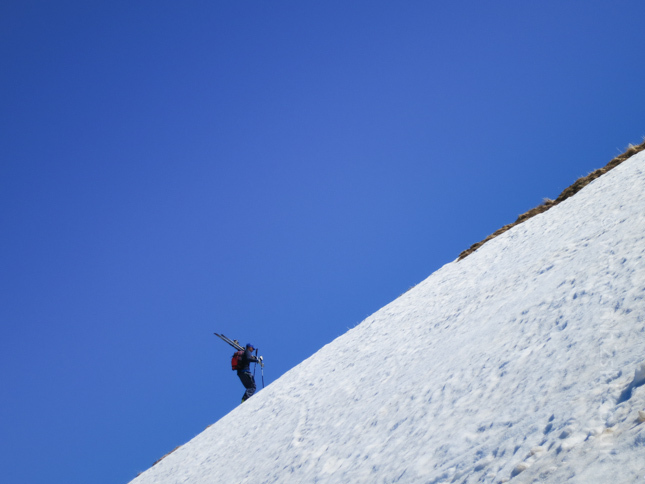 As I skied off on the final pitch, Slippers cried out to me "Martin, you appear to be stemming there mate!". My reply "Shut up (the polite version), it's the best way I can deal with it." Assuming from his statement, it wasn't the prettiest way of getting down. But in the end, I didn't care because somehow I didn't end up face planting. So that was it, our final ski together of the season, followed by a hearty lunch in a mountain restaurant. No worries though, we'll be back skiing together at the start of next winter in seven months time. I left Meribel late Wednesday and returned to Leamington Spa on Thursday, and am now slowly adapting to life down at sea level again. It was another great winter ticked off, but now time to re-start the gym membership and dust off the mountain bike in preparation for next season. Still plenty of blog posts to come over the summer months, including another in a few weeks' time about some wildlife photography I squeezed in before coming home. Feel free to share away on Facebook, Twitter and Google+ by using the social media icons. Or leave a comment below. Martin.